This is a hybrid product in more ways than one — not least because it can be controlled via a dedicated DAW plug-in. Announced at last year’s Summer NAMM, Audified’s Synergy R1 immediately grabbed my attention — studio-quality hardware reverbs aren’t released every day, especially for the 500 series. 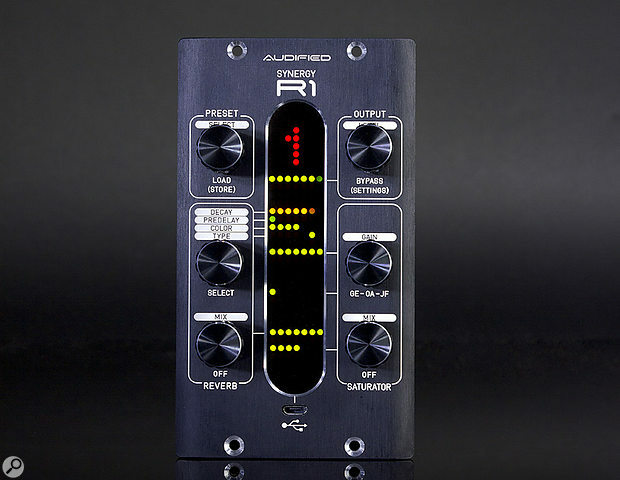 But even in the company of other outboard reverbs, the Synergy R1 stands out. Not only is there a stereo digital reverb boasting a range of original algorithms running on the on-board DSP, but there are also three all-analogue saturation circuits. On top of that, not only can the whole ensemble be operated from the front panel but, courtesy of a tiny USB socket, it can be controlled via software too: there’s a stand-alone app and a (VST2, VST3, AU or AAX) plug-in for Windows and Mac OS. I’ll explore the Synergy R1 first as a stand-alone hardware processor, before moving on to consider the software side of things. The ‘double-wide’ face-plate is required not only because this is a stereo device — which obviously means that it needs access to two channels of the 500-series host chassis’ I/O — but also because you’d never fit all the controls and displays on a single-width module. In my opinion, Audified have used the available panel space to good effect. 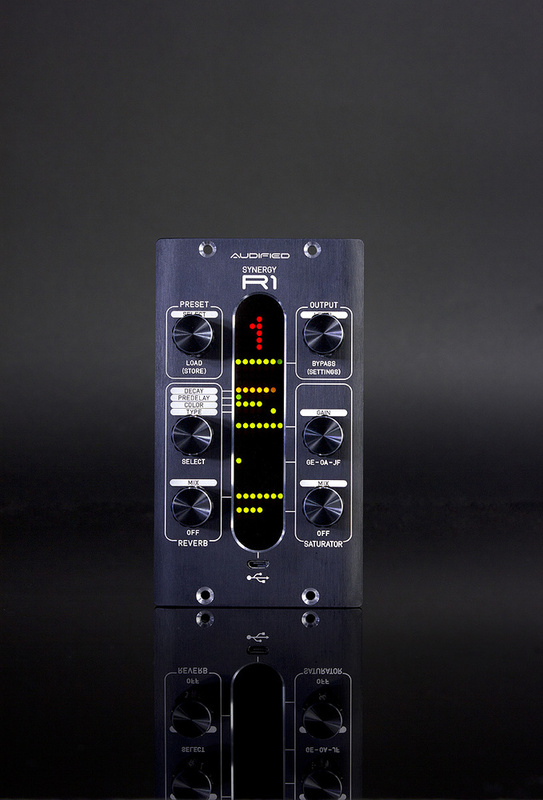 The plug-in control software gives you direct access to every function on the hardware, as well as access to many more presets.The Synergy R1’s fascia is dominated by the knurled knobs of six endless rotary encoders, which sit in two columns either side of a generously proportioned LED display. The three knobs on the left control the reverb processor, and those on the right the analogue saturation circuit; the signal path of the saturator is all-analogue, but it’s digitally controlled, which is great news if you care about precise recall of settings. All six encoders double up as push-switches, the switches allowing you to access different functions. The result is that you already have an immense amount of control from the front panel, even before you throw the bundled control plug-in into the mix. The signal path is fixed, with the audio hitting the reverb engine first and then being fed into the saturation processor. Either section can be bypassed independently, so you can have reverb without saturation, or saturation without reverb. But what you can’t do (at least without first printing the result of the saturator) is to feed the saturated signal into the reverb engine. That may be a missed trick that some users lament, but in my opinion it’s not a huge problem. To control the reverb, starting at the top, you have a preset selector — you turn the encoder to select the desired preset of the available nine (there are many more available via the software), and push to select it. The crisp and colourful LED display shows the preset number at the top — actually, this part of the display is used to indicate other parameters as you turn the other knobs, but it returns after a second or two to displaying the preset. The preset number is amber when not yet selected, green when selected, and red when tweaked but not yet saved. To save your settings (and overwrite the current preset) you press and hold the selector for a couple of seconds. Opposite the preset selector is another triple-function knob, whose primary purpose is to set the output level — as you turn it, the screen displays a number from 0-100, and beneath this a slightly less precise indication is given by a horizontal line of LEDs that remains visible when the display defaults back tot the preset number. Pushing this encoder bypasses the whole unit, including the output level stage. Pressing and holding this knob takes you into a Settings mode, which allows you to adjust the brightness of the LED screen (they’re quite bright by default, but not unhelpfully so), and to choose between stereo (L-R) and mono (L) operation. Beneath the preset selector are two more knobs which you use to edit the reverb portion of the chosen preset. The first is another clever multi-selector, which allows you to choose one of four different parameters — Decay, Predelay, Color and Type — to be controlled by turning the knob. Decay and Predelay are self-explanatory, while Color appears to be an EQ, making the reverb tails brighter or darker, and Type allows you to choose between one of seven different reverb-type simulations, namely Small Room, Room, Hall, Long Hall, Spring, Plate and Tunnel. Horizontal LED meters indicate the current setting for each parameter, and these remain visible throughout. These are normally green but turn amber for the currently selected parameter and, again, when tweaking the parameter the appropriate value is displayed at the top. Finally, the Mix knob adjusts the blend between the dry source signal and that fed through the reverb engine; pushing this encoder bypasses or engages the reverb. Moving on to the Saturator, once again you start with a preset, and turn/press two encoders to adjust to taste: push Gain to select the desired saturation circuit, turn the knob to increase the signal level running into it, and then use Mix to adjust the blend between the processed and unsaturated signals. Push Mix to bypass/engage the Saturator circuit. So that’s how it works, but what about the sound? The reverb algorithms are, as far as I can tell, all original, and to my ears they’re all good ones to boot. The rooms and halls are particularly nice to my ears, particularly when used in conjunction with the Color control. I could well imagine using these for sound-design purposes as much as for mixing music. But that’s not to criticise the spring and plate algorithms, which are the equal of anything I personally have in plug-in form. This was all very easy to tell, since the device itself seemed whisper quiet (the only exception to that was when the USB cable, the analogue audio cables and my MacBook Pro’s PSU cable formed a ground loop — which was not the fault of the Synergy R1!). I almost always found myself preferring a darker sound with the Color control pulled back to a negative setting, but if you prefer George Michael-esque sibilant brightness you’re able to achieve that too. 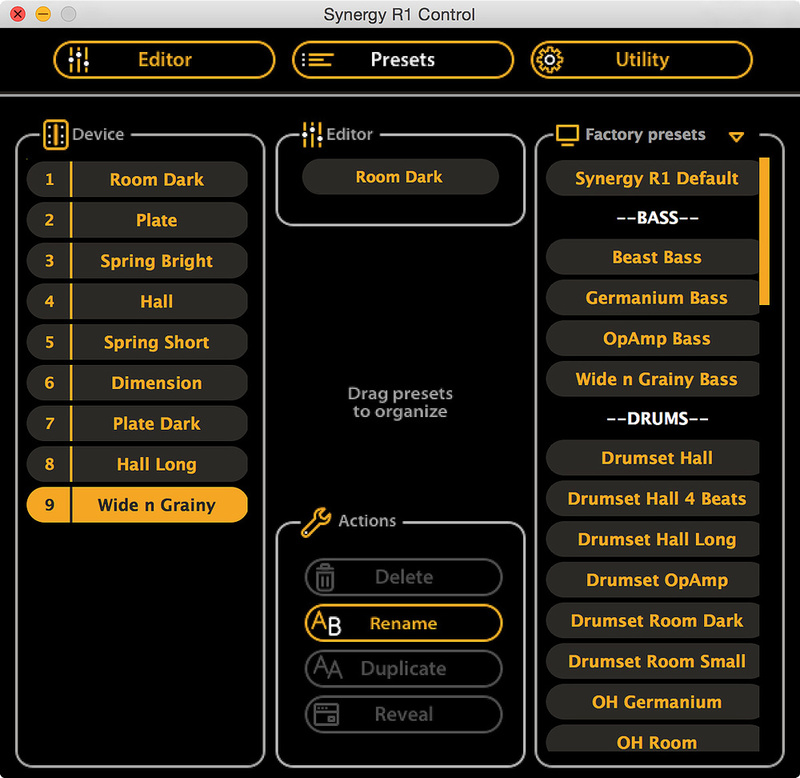 The standalone version of the control software features additional tabs which enable a drag-and-drop approach to managing your presets.What you don’t have is control over the balance of early reflections and the longer wash of the reverb tail, but to be honest, I didn’t find myself missing that — having access to the different reverb types (each of which has different early-reflection and decay characteristics) and pre-delay was enough. The only other quirk to mention is that, this being a hardware reverb (and thus there only being one ‘instance’ accessible in your mix), I’d expected it to default to 100 percent wet for each preset — which you’d always want when setting an effect like this up for use on an aux send. Yet the presets had a range of different wet/dry mix settings for the reverb processor, as if it was intended primarily for use as an insert effect on individual channels. If I were to acquire one of these for mixing, I’d probably run through and change every preset to 100 percent wet... But perhaps I’m being old-fashioned, because, as I’ll mention later, there are plenty of scenarios in which I might end up using this as an insert processor! But of course the Saturator and the reverb processor share the same box and I/O as the reverb engine for a reason — this thing is intended to add some colour either to the reverb tail (when the reverb is used 100 percent wet) or to the combined dry and reverb’ed signal — it’s that latter scenario in which the reverb mix control becomes really useful. Used as a send effect, I found the saturator a delightful means of either pushing the reverb tails slightly backward in the virtual soundstage, or for adding a little grit and grain to make the effect stand out. It’s worth noting that as well as the Gain parameter, the Reverb’s Color control also affects the result of the saturation circuit, and I lost a good couple of hours just playing with the controls on various sources before I started using the Synergy R1 in earnest. Used as an insert processor, the R1 opened up a whole new palette of sounds when paired with certain instruments. While I might want to capture a clean DI at the same time, I could certainly see myself recording a bass guitar through this — or at least inserting it in the cue mix to help me get into the groove, as it can add a touch of width and excitement to the sound which has the potential to inspire better playing. The same goes for synths, too. It should already be obvious that I like this thing, but I’ve not yet given its most striking feature more than a cursory mention. I’m talking, of course, about the ability to control the device via software. Some benefits, such as the ability to store and recall more presets, and to automate parameters, almost go without saying, but there are a few less obvious things to mention. For starters, you can, as with any plug-in, recall whatever settings are used in your DAW project, without even thinking about preset management. 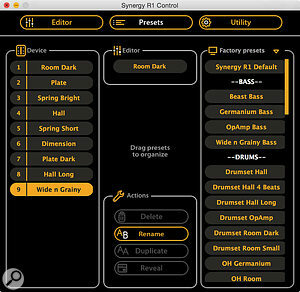 And when using the Synergy R1 as a stand-alone device, the front-panel knobs do give you access to every function, but you have to remember what each selector does — and while the labelling and visual feedback on the LED screen are clear and well thought-out, a software GUI helps enormously in this respect. Another convenience of software remote control is that you can operate this processor without your ears ever straying away from your listening sweet-spot. Even if you’re one of those rare souls who doesn’t use a DAW, the app offers a very convenient means of managing and editing presets, and determining which ones occupy the hardware’s nine available slots. You can choose from around 50 factory presets (plus the nine defaults), and can create, store and deploy user presets too. The stand-alone app and the plug-in are broadly similar — they share the same GUI and control functions, but the stand-alone version also gives you access to a slightly more sophisticated drag-and-drop preset management system, which will be useful to anyone not planning to use this device with a DAW. I experienced a couple of minor niggles, and though I don’t consider them huge issues I should mention them here. On a couple of occasions, when operating the Synergy R1 via the software and then leaving the computer for an hour or so while doing other things, the hardware’s controls and screen became unresponsive (it continued to process the sound, though). Switching the unit off and back on (by switching the host rack off and on, since there’s no front panel on/off switch) and hitting the plug-in’s USB Connection button restored normal operation. There were also a few times when the hardware didn’t respond to my first click of the plug-in’s saturation bypass button — I had to click it a couple of times. I know a firmware revision is being worked on as I write, so hopefully these rare quirks will be ironed out before long. All in all, there’s a lot that’s unique and an awful lot to like about the Synergy R1, and it should hold appeal for use in a number of different applications. I don’t think it’s overstating things to say that the Synergy R1 has caused me to rethink both when and how I use reverb. I can’t remember the last time I decided to print a reverb effect while tracking (other than, perhaps, when capturing the spring reverb of a guitar amp), but with this device I was tempted to do that with both bass guitar and synths. And while I habitually EQ my reverb returns when mixing, it has rarely occurred to me to deliberately distort them, so that’s something I’ll be trying more often too. At the asking price of £1189 including VATaround $1399, it’s not exactly a budget device, particularly if you’re happy using plug-in reverbs and modelled distortion/saturation. But neither is it out of reach for anyone considering a serious hardware reverb (consider the price of a Bricasti M7 or a Quantec Yardstick! ), and the unique, digitally controlled analogue stages are a nice bonus. Of course, Audified are not the first company to release hardware controlled via plug-ins over USB, but this approach is still very much the exception and in my opinion only a handful of pioneering companies (check out the offerings from Wes Audio, Bettermaker and Tegeler Audio, for example) have managed to get it right to date. Audified now deserve to be considered in that company. Three flavours of all-analogue saturation. Front-panel and software control available for all functions. Inspirational — it made me rethink how I use reverb! Saturator can’t be placed pre-reverb. What at first appeared to me to be a quirky idea turned out to be an inspired one — offloading high-quality digital reverb from your computer, and warming the result with your choice of real analogue saturation, and all with the convenience of plug-in control. The Synergy R1 was running firmware version 1.4.4.41. The control app and VST2, VST3 and AU plug-ins (v1.0.2.25) were tested on an early 2013 model MacBook Pro Retina, running Mac OS 10.10.5, Cubase 9.5 Pro and Reaper v5.95.